There is a serious threat to freedom of thought, expression and political opinion in Bangladesh. Atheist and freethinking voices are the target (including the three bloggers paraded by the authorities in the image above). Islamist political parties have provided government with a list of 84 "atheist bloggers" and are demanding the death penalty for "insulting religion". Several bloggers have already been arrested and a government official promised to pursue all those listed. Last week, we said the government would be "walking into a trap set by fundamentalists" if they gave any succour to these demands. But they did. And on Friday a rally on the order of 100,000 Islamists marched in Dhaka (video) calling for a new blasphemy law and for the execution of the atheist bloggers. Earlier this year a prominent atheist blogger was murdered in a machete attack at his home, so we are also concerned about the safety in public of those accused of "blasphemy". 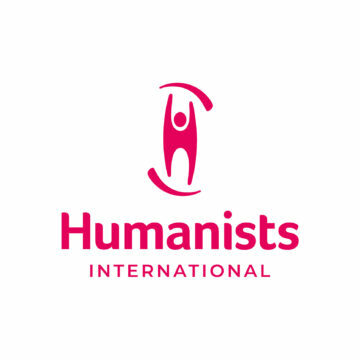 We are urging IHEU Member Organisations and humanists everywhere to act now in solidarity with the bloggers and to put an end to the threats and intimidation. Debate between secularists (committed to separation between state and religion) and Islamists, is not unusual in Bangladesh, especially online. But the debate has now warped into open persecution. As our statement on the arrests made clear, the cause of the escalation is political. The Islamist parties are lashing out after the secular Shahbag movement, which was organised by the bloggers, demanded justice over war crimes committed by leading Islamist figures during the 1971 war of independence from Pakistan. Mukto-Mona is a freethinking blogging network, two of whose Bangla members are among the bloggers arrested. The founder of the group told us: "Government thinks that if they put several freethinking bloggers in jail, it will keep the fundamentalists happy for the time being. The government has taken this easy route to appease a handful of mullahs whose support they need to win the upcoming election." This means that not only are bloggers being targeted as atheists, the campaign is also a ploy on the part of the Islamist opposition parties, and the rights and freedoms of the non-religious are being used like cards in the hand of the government, to be played however it best suits them. Government has given a mixed message. The Prime Minister Sheikh Hasina has reiterated that Bangladesh is a constitutionally secular country and said, "Bangladesh does not need laws against blasphemy." However, she also said that "existing laws are enough" because "If anybody tried to hurt any sentiments of any religion or any religious leader, there is a law. We can take any action." 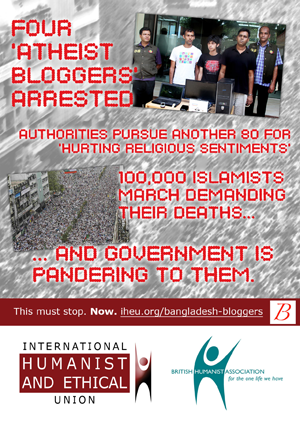 At IHEU we are working with freethinking bloggers and Bangla activists and making use of diplomatic channels to apply pressure on the Bangladeshi authorities. We are also encouraging our member organisations to lobby their ambassadors to Bangladesh. But we need a coordinated, global response to defend the right to express religious criticism and secularist principles, and also to defend political activism; if the government gives in to oppressive demands now, any debate with Islamist parties in the future may be branded "hurting the sentiments of religion or religious leaders"! 1. Express your dissent online. 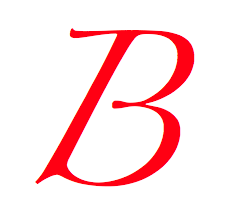 There is a "Scarlet B" campaign for bloggers and others to express solidarity with the Bangladeshi bloggers (use the image on the right). The Twitter hashtag #HumanistSolidarity has also been used in connection with the Bangladeshi bloggers. 3. Contact the ambassador to Bangladesh from your country. The American Humanist Association has urged its members and supporters to contact the US Ambassador to Bangladesh and express their concerns. Individuals in most countries can undertake a similar action, writing to protest the arrests, and the threat to freedom of speech they represent. If a national ambassador receives even a small number of letters on the same topic this can draw an issue to their attention and raise its priority with the foreign government. 4. Contact the Bangladeshi embassy or foreign office desk. This may involve a little digging to find the right correspondence address or email in your country, but a short missive drawing attention to the arrests could mean another authoritative voice feeding back to the Bangladeshi government that all is not well! Please feel free to copy us into your correspondence on this issue using comms@iheu.org. 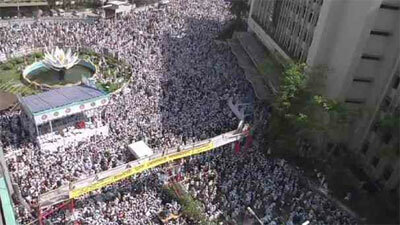 Many organisations are holding protests on Thursday 25th April in support of the Bangladesh Bloggers. For the IHEU-British Humanist Association leafleting protest on Thursday 25th in London, UK, we created the leaflet seen to the right. This is available to download and use by any campaigners on this issue. There is a section on the reverse specific to the UK which you should replace to suit your own protest. For designers: It's a double-sided leaflet which will print to interntional standard A6 paper at 300 dpi (or could be used as an A5 leaflet without significant loss in resolution at 150 dpi). You can download the .zip archive containing flat .jpgs (two pages, "p1" and "p2") as well as original corresponding Photoshop files. The image contains non-copyrighted photographs freely sourced, and makes use of one non-standard, freeware font, Dots All For Now Dirty JL, which you would need to download to edit the text of the headlines. Without Photoshop, you could still edit the flat jpg files in a simpler paint program, and simply add a substitute logo and text over the back.